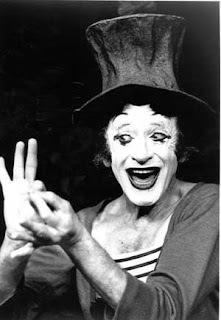 The man synonymous with the word "mime" died in Paris on Saturday September 22. The incomparable MARCEL MARCEAU was buried today in the equally incomparable Pere Lachaise cemetery. Every non-clever epigram about "silence" has been written and uttered a thousand-fold, and if there's a clever one out there, I haven't heard it. This genius of gesture will be mourned by everyone who loved and appreciated his art-- and faux-mourned by a whole ton of people who have for years been exchanging groaning mockeries about mime over their coffees and cocktails. At some point, perhaps in the 80's, it became fashionable to pron ounce mimes of all sorts ridiculous and annoying. I suppose there were members of the profession who brought this on themselves: TV variety mimes Shields and Yarnell made it a coy and sentimental mass-marketed art, and it seemed for a time that big-city squares were teeming with street buskers who thought there was nothing more to the art than painting on a clown face and moon-walking inside an imaginary box. And then asking for money. This in turn gave a lot of cool sophisticates and stand-up comics license to put mimes on their list of people to be anathematized without fear of argument. Some of us, however, stayed quietly loyal to the great art, and kept an eye out for people who were actually good at it, or drew on it in a newer context. Johnny Depp comes to mind, in Benny and Joon. But the Undisputed Master of the art remained this man I'd had the privilege to see in live performance a couple of times when I was in high school. (I think I have an autographed programme somewhere.) 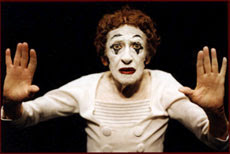 I never saw him again after that, but paid him the best tribute I could by taking two semesters of mime from another, albeit unsung, master, Kaz Piesowocki at the University of Victoria, British Columbia. 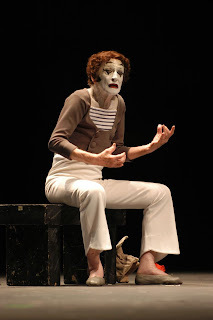 Mime was part of the Acting program. I took the one compulsory Acting course without intending to ever put it to use in performance. But the mime component I returned to for a second round. I was just interested in finding out how it works-- gaining an appreciation for the way that acting starts with a physical "impulse" from the heart, and seeing how stripped-down essentials can communicate as much or more than busy details. 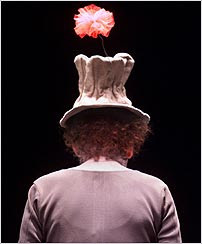 Kaz retired in 1998, the same year Marcel Marceau came to the U-Vic Phoenix Theatre and spoke to the students. Wish I had been there for both events. 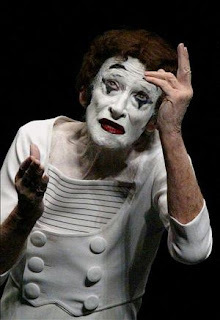 I knew of Marcel Marceau as a clown and a tragedian under th e Klieglights, but never knew until the obits [and here] came out this week about his role in the great tragedy of our time: being a Jew in France during the Nazi occupation, working for the Resistance to help others escape, losing his father to the ovens at Auschwitz. 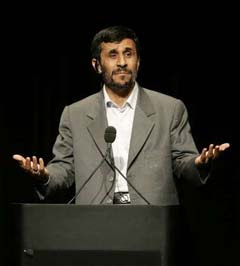 One is left wondering how, after all this, the optimistic spirit of his "Bip" could ever be born. Yet he was, and lived to be 84, and left this world unrivalled. I'm not sure he would have been so happy about that: a rival would have also insured a successor, which he plainly desired. Let's hope for that. 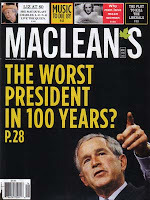 Or this gem from 2006 (the answer to their question being, of course, "NO, that would be Jimmy Carter, by the landslide the voters didn't give him in '76. Now that's HARD-HITTING JOURNALISM, EH? We're so proud, up here in the Great White North. And how do we know this cover is a lie? 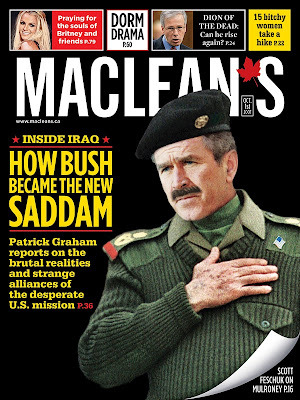 HOW DO WE KNOW THAT BUSH IS NOT SADDAM, and that any suggestion of a resemblance between the two is so unspeakably, ungratefully STOOPID that is just defies human understanding???????? Because there's not a cloud of toxic gas now floating north of the 49th parallel in the vicinity of the Maclean's head office (that's One Mount Pleasant Road, Toronto...). 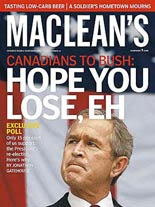 Because Maclean's Editor Kenneth Whyte has not, to my knowledge, been hung on a meat-hook and beaten to death. 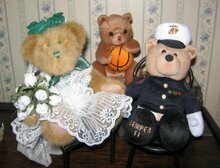 Because, ... because, ... well, as Kathy Shaidle [new blog alert!] might put it, "If Bush is a Nazi why aren't you a lampshade?" Whadd-I-say??? Huh? Hey, don't taze me, bro! New York City opens its doors (well, a few of them) to our buddy, Madmood Ahmadinnerjacket, so he can lay down some peace, love, and sure-I'm-a-feminist vibes for his adoring left-wing public. There were lots of places he wanted to go, but couldn't manage to get them all onto his already crowded itinerary [smiles and a hat-tip -- Hart Seely at Slate.com]. 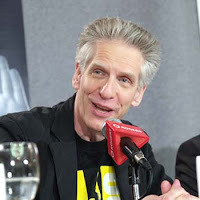 Film "auteur" and perennial ghoul David Cronenberg unveiled (as 'twere) his latest work and won the big prize at the TIFF. It's called Eastern Promises, and is the latest venture in a time-tested cinematic genre that has become Cronenberg's new signature style: Naked Tattooed Viggo-Vision. Our spies are certain they overheard the feted (fetid?) director muttering: "Well, if I can't have him, at least I can watch." This review brought to you by someone who hasn't seen the movie. Too busy watching 3:10 to Yuma. Posted by Winefred at 5:29 p.m.